Beyonce Knowles, commonly known as Beyonce, is an accomplished singer and actress. She has won many awards for her achievements throughout the years. In the entertainment industry Beyonce is widely known as the Queen of Pop. Her cutting-edge music and dance moves continue to set the tone for style and fashion in today's celebrity-driven world. Beyonce was born September 4, 1981. Her parents, Mathew and Tina Knowles, named her Beyonce Giselle Knowles. She originally hails from Houston, Texas. She has one younger sister, Solange, who followed in big sister Beyonce's footsteps and went into entertainment as well as a musician, model, and dancer. She also has a half-brother named Nixon. When Beyonce was little she was quiet and shy. Like most parents of shy children, her mother looked for ways to get her daughter socializing with others, so she signed her up for a local dance class. This was one of the best things her mother could have done for her, because Beyonce excelled in the class. She soon broke out of her shell and discovered a huge talent: singing. The young Beyonce began singing in and winning local talent competitions. She auditioned for a group called Girl's Tyme and was invited to join, which gave her a great deal of practice performing in front of a crowd. These early experiences would prove vital to her later career. Girl's Tyme participated in the television competition Star Search in 1992. They did not win the competition, but this first taste of stardom might have been what spurred Beyonce to continue forward to what would one day be a successful career in music. Mathew Knowles, Beyonce's father, became the group's manager, believing they could get a record deal. The group changed what it was called many times to names such as Somethin' Fresh, The Dolls, and Destiny. Beyonce's musical career is rich and diverse. She has found success that eludes many of today's vocalists. Her achievement is likely because of her varied abilities. Her songs are fresh, sassy, and upbeat. She is what is known as a triple threat, being skilled at singing, dancing, and acting. Below is a list of some of her more notable releases and achievements. 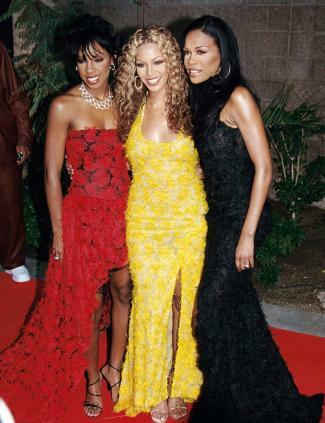 In 1997, Columbia Records signed the group, now called Destiny's Child, to a record deal. Beyonce, Kelly Rowland, LaToya Luckett, and LaTavia Roberson's first song was titled Killing Time and was featured in the blockbuster film Men in Black. In 1998, the group released their first self-titled album. The first single off the album, No No No, quickly reached the top of R&B charts. The single sold over one million copies. When Destiny's Child released their second album, The Writing's on the Wall, two tracks, Bills, Bills, Bills and Say My Name, helped the group win two Grammy Awards in 2000. The Writing's on the Wall sold more than eight million copies. In 2003, Beyonce made her debut as a solo artist with the album Dangerously in Love. Beyonce's third album, I Am... Sasha Fierce, was named for Beyonce's on-stage alter ego. Released in 2008, the album immediately topped the Billboard 200 chart and won five Grammy Awards. In 2011, Billboard Magazine honored Beyonce with its Millennium Award. For the show, she performed Run the World (Girls), a female-empowerment anthem and the lead single from her chart-topping fourth studio album, 4. 2013 saw the release of Love Songs, a compilation album of songs by Beyonce's band, Destiny's Child. It featured Nuclear, the first original song by Destiny's Child since 2005. Beyonce has been nominated for two Golden Globe Awards and has won 17 Grammy Awards. She is one of the top-selling pop artists of all time. In 2001, she appeared as Carmen in MTV's Carmen: A Hip-Hopera. In 2002, alongside Mike Meyers, she played the 1970's siren Foxxy Cleopatra in Austin Powers: Goldmember. In The Fighting Temptations, Beyonce played a more substantial role. The 2003 film earned over 30 million dollars at the box office. In 2005, she played the pop-star Xania in The Pink Panther with Steve Martin. In the 2006 blockbuster hit Dreamgirls, Beyonce played Deena, a member of the group The Dreamettes. In 2008 and 2009, she starred in two movies: Cadillac Records with Adrien Brody and Cedric the Entertainer and Obsessed with Ali Larter and Scout Taylor Compton. Both films did very well in theaters. Beyonce's boundless creative energy shines in numerous areas of endeavor, including philanthropy, fashion, and product endorsement. She is highly photogenic and a favorite of the entertainment press. Her musical influences include Michael Jackson, Madonna, and Mariah Carey. She co-founded the Survivor Foundation, which was created to provide transitional housing for hurricane victims. Beyonce has launched three lines of fragrance - True Star, True Star Gold, and Pulse - and started her own fashion line called the House of Deréon. Since 2002, Beyonce has done promotion work with the soft drink company Pepsi. In 2012, a partnership between Beyonce and Pepsi was announced. In 2012, Forbes put Beyonce and husband Jay-Z at the very top of their list of the world's highest-paid celebrity couples. In 2013, Beyonce produced and starred in Life is But a Dream, an autobiographical film for television. The documentary was well-received by fans and critics. Beyonce's star is already shining brightly, but it sure to rise even higher in the coming years as her talents continue to develop and she explores new avenues. She is a true superstar who knows how to market her talent and image.